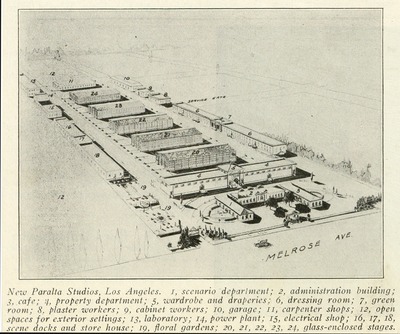 "Paralta Studios, Los Angeles, 1918"
Article: Motography Magazine; April 20, 1918, “New Paralta Studios Near Completion” Located on the north side of Melrose Avenue just beyond Van Ness Street, Los Angeles on 80-acre tract. (Hollywood). Illustration of buildings scanned.